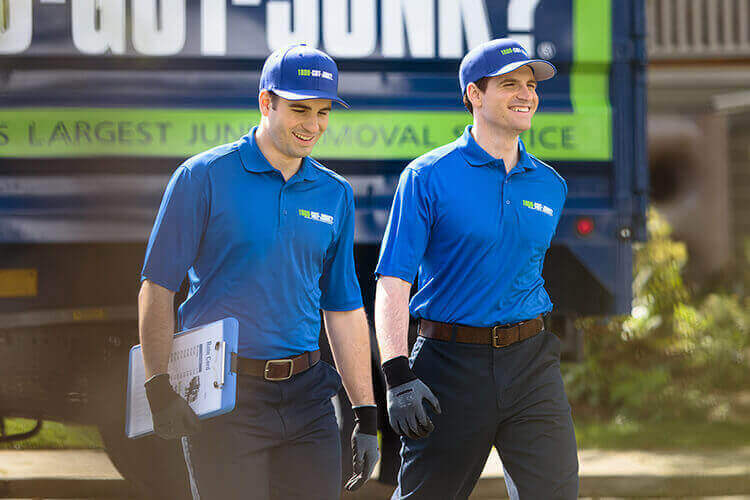 Carpet Removal & Disposal | 1800-GOT-JUNK? 1800-GOT-JUNK?’s carpet removal service includes the whole package – we’ll come to your house, remove your old carpet, take it out to our truck and clean up after. We’ll ensure your old carpet is disposed of responsibly and we offer carpet recycling whenever possible. Are you remodelling and putting in new flooring? Whether you’re replacing your old worn out carpet with new carpeting, or putting in hardwood flooring or tile instead, you may be wondering what to do with your old carpet remnants. What if you could just point, and make it all disappear? At 1800-GOT-JUNK?, we can take all types of household and commercial carpeting as well as large area rugs. After we remove your carpet, we evaluate the condition and decide whether it should be disposed or recycled. Rest assured, we always choose the most environmentally-friendly method available. If you’re not sure how to go about recycling your carpet on your own, give 1800-GOT-JUNK? a call. Old ripped up carpets can be bulky and tedious to get rid of on your own. That’s where 1800-GOT-JUNK? comes in! We specialize carpet removal and can take care of everything for you. All you have to do is point, and your carpet disappears! Give us a call today. Can 1800-GOT-JUNK? rip up my old carpeting & haul it away? Yes! The team members at 1800-GOT-JUNK? are professionally trained to handle the toughest junk jobs including ripping up your old carpet and removing it for you. We always do our best to recycle any old carpeting. What happens to carpet when it’s gets to the landfill? This is why it’s so important to recycle carpet when possible. When you call 1800-GOT-JUNK?, we’ll handle your carpet recycling for you. We’ll pick up your old carpet, load it into our truck, and ensure it gets recycled or properly disposed of.